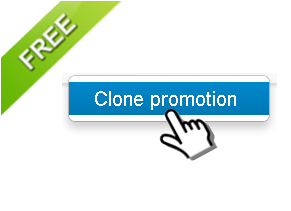 The Clone Promotion add-on allows the Admin to clone promotions with all info and conditions. Works good for both Cart and Catalog promotions. This add-on can be especially useful for those who create complex promotions and run them simultaneously. Thus, it is not necessary to manually fill all fields, you can just press one button to get the copy of an existing Promotion. Adds a Clone promotion button on a promotion editing page (CS-Cart 4: Marketing -> Promotions . Choose the necessary Promotion and click the Choose action button at the top right corner, then choose Clone promotion), (CS-Cart 3: Products -> Promotions. Choose the necessary Promotion and click the Clone promotion link at the top). Works for Cart and Catalog promotions. Clones all Promotion standard details such as name, description, available period, conditions, bonuses, etc. The cloned promotion automatically gets a Disabled status. Admin should change this status manually when it's time for it. This add-on is compatible with CS-Cart versions 3 and 4 with one storefront. Notice! You will be able to download the add-on from your order details page. 1. Download the archive with the Clone Promotion add-on. 3. Log into the administration panel of your store, go to the Administration -> Add-ons page (for Cs-Cart v.3) and Add-ons->ManageAdd-ons (for Cs-Cart v.4). 4. In the list of add-ons find the Clone Promotion add-on and click Install opposite to its name.